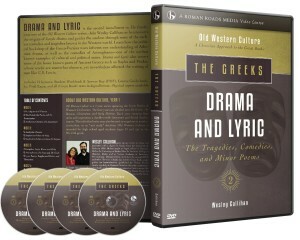 Old Western Culture: The Greeks is a full-year literature and history curriculum for high school students (and above). 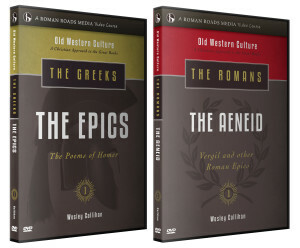 Guided by storyteller and veteran teacher Wesley Callihan, learn about the greatest and most influential works in Western Civilization, starting with the two epics poems by Homer, the Iliad and the Odyssey. Discover the genius of the Greek playwrights at describing human emotion. Enjoy the winding story telling of Herodotus, the “Father of History.” And ponder human nature with Plato and Aristotle. See how God used these Pagan works in the history of the world, and particularly in the history of God’s people. Enjoy! We also offer live classes for the Greeks and writing and grading services. Looking to buy just workbooks or just readers? Looking to buy individual units from The Greeks? 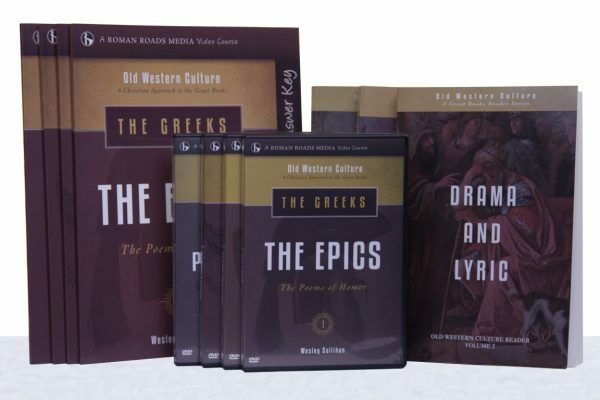 Old Western Culture: The Greeks is a full year of instruction divided into four units: The Epics, Drama and Lyric, The Histories, and The Philosophers. 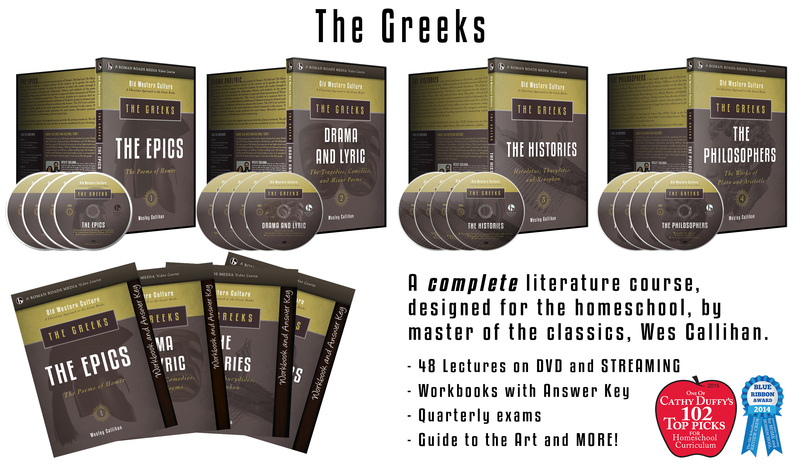 With over 20 hours of video instruction, reading assignments in the Great Books, accompanying exercises after each lecture and reading assignment, and 4 end-of-term exams, The Greeks offers the homeschooler a complete literature and history course. Intended for high school aged students (14+), as well as for the adult enrichment student. As an integrated humanities curriculum, The Greeks explores history, theology, philosophy, poetry, and art from the perspective of the greatest works of influential literature of the Western world. Hundreds of classical paintings, maps, timelines, and more are woven into the video lessons! See individual titles for more information on each unit and what they cover. “The Books” tab offers a complete list of works covered. Old Western Culture is a video course. It is built around a master teacher, Wes Callihan. With decades of teaching experience, he guides students through the story of Western civilization. Each unit of The Greeks contains 12 video lessons (48 in year 1, approx 30-40 min each). 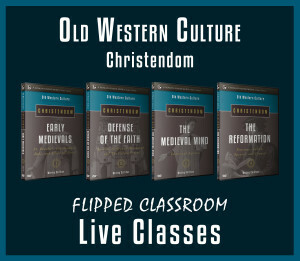 Each year of Old Western Culture is a double-credit Humanities course which is most commonly broken down into 1 Literature credit and 1 History credit. The double-credit assumes that the student will watch all the videos, read the required reading, answer the daily worksheets, and take 4 exams (one for each unit). This a robust course academically, and requires a fair bit of reading. Wesley Callihan will coach your student on how to approach the reading in the video. Average daily reading load is 30-40 pages. WHAT’S INCLUDED IN YEAR 1, THE GREEKS? When you purchase Old Western Culture: The Greeks you receive access to the online streaming portal for The Greeks. If you choose the “Add DVD” option, you will also receive all 4 DVD sets. – A Student Workbook and Answer Key in PDF format for each unit (optional physical versions available). – An A and B exam with teacher guide and answer key for each unit. – A Digital “Guide to the Art” booklet. Lecture 2 – The Backdrop to the Iliad. Lecture 12 – he Legacy of Homer in Western Civilization. Each reader in the Old Western Culture Reader Series pairs with a unit in the Old Western Culture Curriculum and provides all the works that you need to read for that unit. We’re currently working on readers for every unit. If you already have the required books, you’re set to go. The course material will give you the details on what parts to read and when. 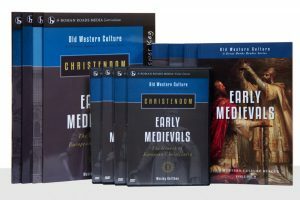 Our materials page includes links to digital versions of all the necessary texts. You’ll need to get an account to access the page, but it’s free and takes less than a minute to sign up. To access the course Materials, log into My Romans Roads on the menu above. If you don’t have an account, it only takes about 10 seconds to create one, and it’s free! Once you’re logged in, go to the Materials tab, and then choose The Greeks. Make sure and scroll down to see the content!